FREE Santa Photos – Get Professional Pictures with Santa for FREE In the Northwest (and Nationally)! Free Santa Photos for the NW (Updated for 2018)! Santa photos are a tradition for many families, but they can be so pricey. The great news is that there are some quality free options available if you want. I have compiled a list of Free Santa Photo opps I am aware of. Please comment below with any additional ones you find. Some of the free photo opps are already going on! My favorite thing about many of these free opportunities, is that many offer experiences – rather than just a quick photo (ie: there are free beverages and treats too)! We have done a few of these personally, and it has become a new family tradition for us! Bass Pro – National – Now through December 24th. – This year they have changed the process a bit. You will need to sign up to get a Bass Pass with the time you want to go (visit the ticket booth in store for your Bass Pass). Timeslots are available at various times throughout the week. Get a free 4×6 studio quality photos with Santa in store, free games, crafts and more! Be sure to check their schedule for specific times. Cabela’s – Lacey & Marysville in NW , Now through December 24th. This will work the same way as Bass Pro this year, for the Santa Wonderland. You will need to sign up to get a Bass Pass with the time you want to go (visit the ticket booth in store for your Bass Pass). Timeslots are available at various times throughout the week. Get a free 4×6 studio quality photos with Santa in store, free games, crafts and more! Be sure to check their schedule for specific times. THE REAL Santa & Mrs Claus and get your picture taken for FREE, with donation of a toy to Footprints of Fight! This year Santa will also have his REAL LIVE REINDEER at the event! Enjoy the Christmas Music, refreshments, kid crafts, and write a letter to Santa! These photos will be professional quality and will be taken by a high quality professional photographer. Christmas At The Old Cannery – Sumner; Saturdays and Sundays, now through Dec. 23rd, 11:00am to 4:00pm (note lines can get very long for this event, and they will close the lines at 1pm if they are getting too long). Horse drawn Carriage Rides will are available on the weekends. Lines can get long closer to Christmas (up to 3 hours), so we recommend going early. They do accept cash donations for local food bank. 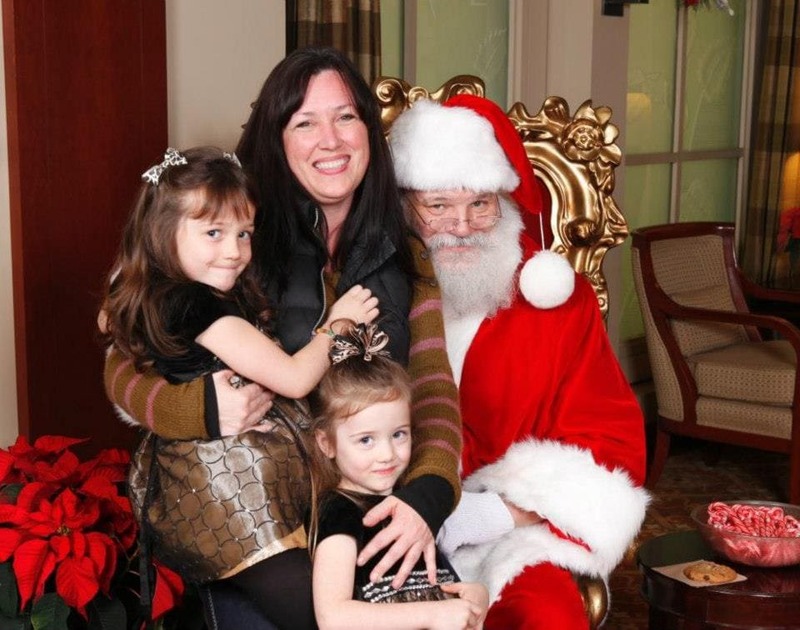 Bring your children and four-legged friends to capture holiday moments with Santa. Santa’s House will be open the first three Saturdays in December. Photos can be downloaded for free on the event facebook page. Visit Santa and take FREE photos at PinkaBella Cupcakes™! Our photographer is providing complimentary services. Each family receives a free digital photo or printed 4×6. To support neighbors in need, we invite you to donate a non-perishable food item to donate to Issaquah Food and Clothing Bank. We appreciate our friends & family so much and this event is our opportunity to give back to YOU! We do FREE Santa pictures and lots of other goodies & fun! Just come and hang out, see Santa and have fun with us! Skip the long lines at the malls and come celebrate! This will be a White Christmas Market at the Weatherly Inn, with photographer on hand for Santa photos. The reindeer’s will be there, shopping, entertainment and more! Join the Chris Jones Bothell State Farm Agency in celebrating the holidays! Kids & pets are welcome to take professional pictures with Santa at the Chris Jones Bothell Agency! Come enjoy hot cocoa, pictures and more! Inflatables – fun for kids & parents! This event is also supporting Toys for Tots, so they ask that you bring a toy donation, but it sounds like its the same Santa from the Motif Seattle event! Covington Creek Nursery – Covington; Saturday, December 1, and Sunday, December 9 from 11 AM to 4 PM. Kids, families, Pets, And friends are all welcome! Santa and Mrs. Clause will be on site. They will take photos and send you a digital copy you can print off. 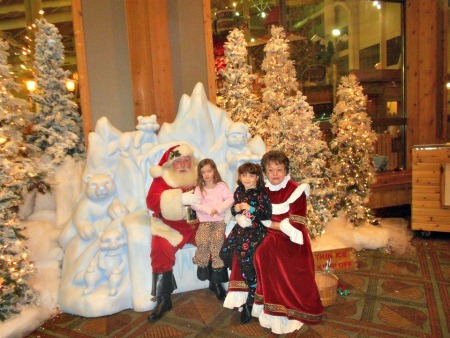 Here is a free photo we got with Santa and Mrs. Claus while we stayed at Great Wolf Lodge a couple of year ago. Get a great frame, and the photos you take with your kids and Santa can be just as fun as the professional ones! Here are some ideas for where you will find Santa if you want to get free photos with your own camera! Pike Place Market – Nov. 24th – take pictures with Santa from 11am to 5pm! Woodenville Winterfest at Molbaks on 11/27 – fun festivities and photo opps with Santa! Sky Nursery – December 2nd, Take photos with Santa and other festivities. Free Photos you can take yourself at Sunrise Village on 12/1, 8th and 15th with Santa in his Sleigh! Hometown Holidays December 7th in downtown Camas (technically Wa. but near Portland area). (also enjoy hay rides, kids’ crafts, tree lighting and a hot cocoa bar). Decemberville December 1st, 10 to 4 in Southeast Portland. Enjoy free antler ears while supplies last, double-decker bus rides, and more. Donations of toys and children’s clothes requested to support. Raphael House. 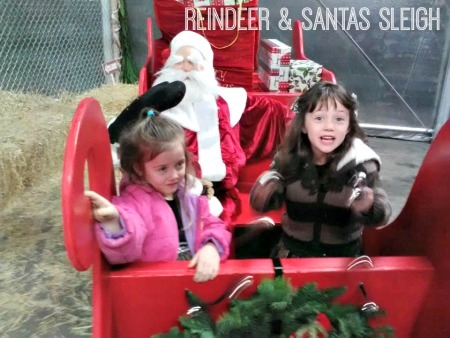 Santa’s Place – East Portland, Bring your own Camera and get photos with Santa and kids can play in the toy shop too! This Santa Sleigh is Carpinitos in Kent, and there are live reindeer for viewing behind the fence you see in the picture above. Viewing and photos with your own camera are FREE! Celebrating the 25 Days of Christmas ~ Activities List – Find a list of fun activities to do all during December! Thanks Cheyanne! We got Walmart added to the list – great tip! Is 12/1 and 12/2 the only days? Hi Wendy, I believe that is an older comment. I did not find any Walmarts doing the photos around the NW this year. Let us know if you find out differently! Any ideas on where to get free Santa photos in the Portland area? 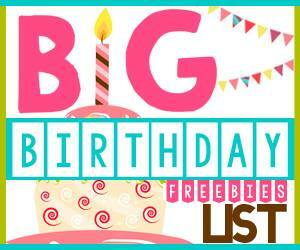 Hi Catherine – there are the national offers (Walmart, Walgreens, Bass Pro and Cabelas). A reader also left this tip on the TNWM Facebook page “Tomorrow, Santa will arrive by train in Independence, OR outside the library and free photos will be taken from 1-3”. I will look around first thing next week too, and see if we can start to build a better list for those of you in the Portland area too! 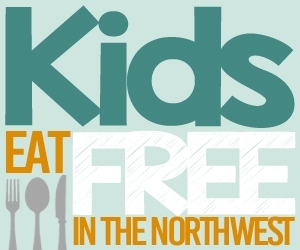 Anacortes has events every weekend, some and free, some are low cost, as well as some fundraising functions! Thanks Robyn! Looks like the free santa photo event was tonight, and I did not get it added in time…but I have marked it down to be sure and add to next years list. Thanks for the tip! We go to Molbaks Nursery every year. Not only is it festive and gorgeous, but you can take your OWN pictures with Santa for free! Oh yes, I grew up going to Molbaks (and Whites) Raelyn – they are my moms 2 favorite nurseries. We love it there too! In the Puyallup, Tacoma, Spanaway, Frederickson area – the local fire department – Central Pierce Fire & Rescue does free Santa photos every year. Just go to the Events and Activities in their website to find the times and locations. Centralpiercefire.org I tried to copy the link but I don’t know if it will work. There are cookies, juice, coffee and meeting with Santa. Heaven Sent – 1200 S 324th Federal Way is also doing them for free. Sun. December 4 12-3pm. Thanks Rori – do you have a link to their event (I dont see it on the Happenings page of their website)? Are they taking the photo and giving it to you, or do they have a santa on site you can use your own camera to take pictures with. If we can get these details we will add it to the list. Thanks so much! Good to see this tradition is free for all the good boys and girls … thanks for the info! 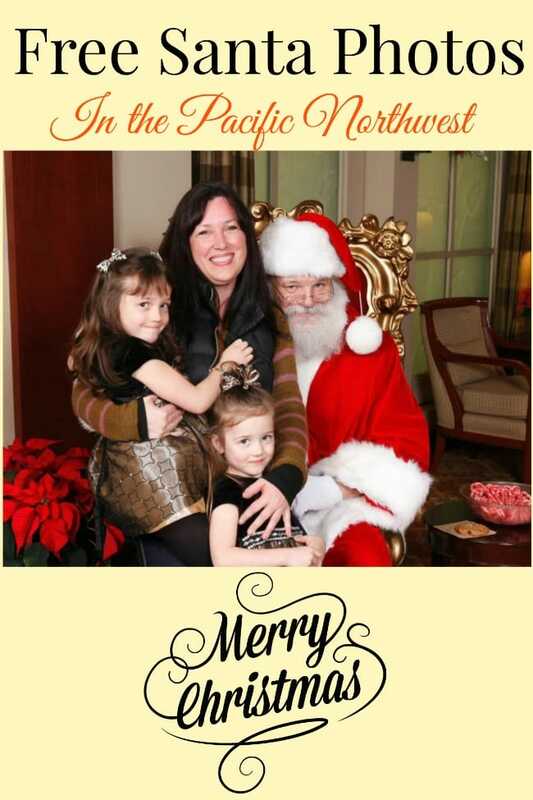 Jim – Thank you for letting us know about the Santa pictures at Crowne Plaza. I didn’t read this post until it was too late. We have attended the Motif Hotel Santa pictures for the last 7 years in a row. My daughter was devastated last night when I told her we probably weren’t going to get Santa pictures this year (since Motif is taking a year off). Do you know how we can find out Santa’s schedule? We are really hoping for the Motif Santa. Any tips you can provide would be greatly appreciated! Hope that helps you guys get your picture this year. If we learn any more about the Motif santa we will let you know. Thanks! Thanks for catching that Crystal, we will update the wording on that.